Gobble, Gobble! Happy Thanksgiving from Drum Corps International! 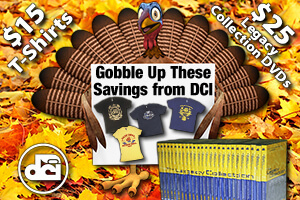 For a limited time only, visit shop.DCI.org to save on T-shirts and the popular Legacy Collection DVDs. Through Thursday, Nov. 22, all T-shirts have been marked down to $15, their lowest price of the season. Hurry, many of the most popular sizes sell out quickly. Drum Corps International's 26-volume Legacy Collection, captures the top World Championship performances of your favorite corps dating all the way back to 1974. Normally $35, grab your favorite Legacy Collection years this week for just $25 each. Shop all Legacy Collection DVDs. A T-shirt with vintage graphics paying homage to J. Birney Crum Stadium, site of the longstanding DCI Eastern Classic event. One of the most popular Legacy DVDs, featuring Santa Clara Vanguard's Championship-winning "Phantom of the Opera" and Phantom Regiment's second-place "New World Symphony." An official T-shirt commemorating the 2012 World Championships. Along with the Blue Devils' fourth Championship title, 1980 marked the highest finishes ever by the second-place 27th Lancers and third-place Bridgemen. Features the names of the more than 400 corps that have competed at the DCI World Championships since 1972. The Cavaliers grabbed their second title in DCI history in 1995 with Gustav Holst's "The Planets," while the Cadets edged their way into second with "An American Quintet," and the Blue Devils took third with their dark and sinister "Carpe Noctem." Offers cannot be combined with other promotions or discounts. Drum Corps International reserves the right to modify or cancel promotion at any time. Promotion begins Nov. 19, 2012 at 9 a.m. ET and ends Nov. 23, 2012 at midnight, 12 a.m. ET.